This hike, relatively short in distance, can be quite challenging due to footing. Starting from a parking area near the end of Frosty Hollow Road (Straight ahead as Frosty Hollow Road ends at Austin Farm Road), first pass the gate and then head north on Matteson Plain Road. The first mile of this hike climbs uphill, into West Greenwich, on the old road that is predominantly loose stone and gravel passing Newman Trail on the right. Along the way on the left you will notice several “No Trespassing” signs. This is the Camp-E-Hunt-Tee property and is not open to the public. At the top of the hill (around the one mile mark) you will notice yellow blazes indicating a turn to the right. Follow the yellow blazes. This is part of the Breakheart Trail and will lead you to the Newman Trail. This segment is all down hill and tends to be a little rocky. It is much easier footing than the first mile. Stay on the yellow blazed trail when you come to the trail crossing at the small footbridge. Ahead you will see some stone walls and eventually a trickling brook. The yellow blazed Breakheart Trail turns left at the north end of Breakheart Pond. Take a quick peek. It is a nice view, but you will be turning right here (west) onto Newman Trail. Now heading west you will first pass the Hicks Trail to the left, continue straight. You will soon pass another trail from the right, again continue straight. Soon you will see a hill ahead of you. There should be a trail to your left here. Turn left and take it. It is unmarked, lesser traveled, and leads through a beautiful fern covered forest back into Exeter and to the parking area. This is a relatively short hike in the western part of the Arcadia Management Area. The hike follows three main trails including the northern end of the Deep Pond Trail. If you want to actually see Deep Pond you would need to follow the southern end of the Deep Pond Trail. Starting from a gated trail head on the opposite side of the road from the Roscoe Dexter parking area, I followed the white blazed Deep Pond Trail. I immediately noticed several outcrops, and stone walls. About a thousand feet along the trail and on the left is a historic cemetery. The dates on the barely readable stones are from 1829 and 1837. Soon I reached a split in the trail. The white blazed trail continues ahead. I would return from there. For this hike I turned left and followed the unmarked trail through more areas of stone walls. The trail ends at the yellow blazed Tippecansett Trail where I turned right. At the time of this hike this section was quite muddy. I soon passed the blue blazed Pachaug Trail to the left while continuing to follow the yellow blazes. After a little bit of uphill hiking the Tippecansett Trail comes to Old Voluntown Road. The yellow blazes turn to the left here. The white blazes to the right represents the northern most portion of the Deep Pond Trail. I turned right here following the white blazes. Soon the trail leads to the end of the developed section of Old Voluntown Road. After a short stretch of road walking the white blazes lead you to the right and back into the woods. From this point follow the white blazes to the beginning of the hike. Intersection of the Tippecansett Trail and the Deep Pond Trail. Mostly easy, very difficult in areas. This is one of those hikes I would not suggest for beginners or those uncomfortable with being in very remote sections of the woods. In order to do this hike as described you should have a good sense of direction, instinct, and balance. Bushwhacking is required in one spot. A copy of the Great Swamp Press map for this area is highly suggested as well as GPS for backtracking. There are three distinctively different parts to this hike. 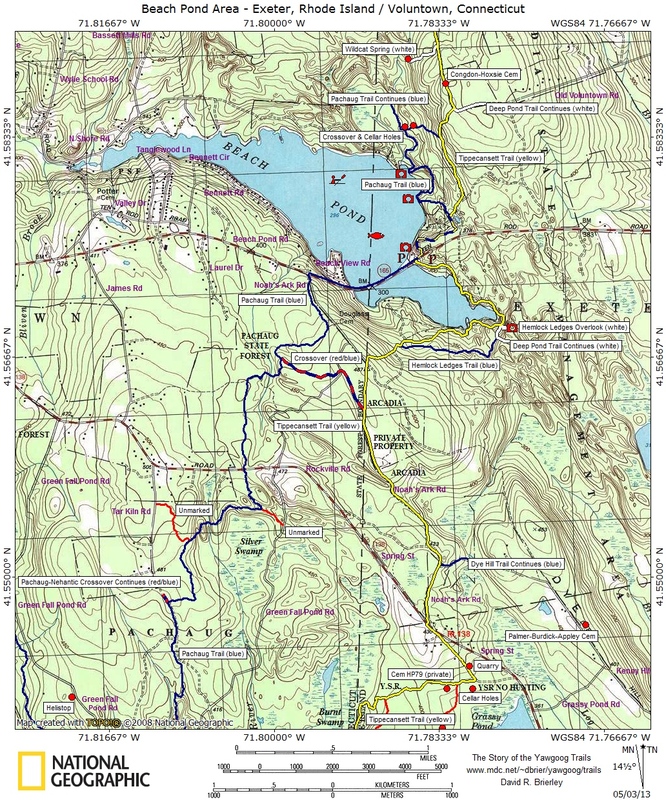 The beginning and the loop around Deep Pond are nice gentle trails, a good portion is walking along dirt roads, and a stretch that follows an unmarked narrow trail has many challenges. 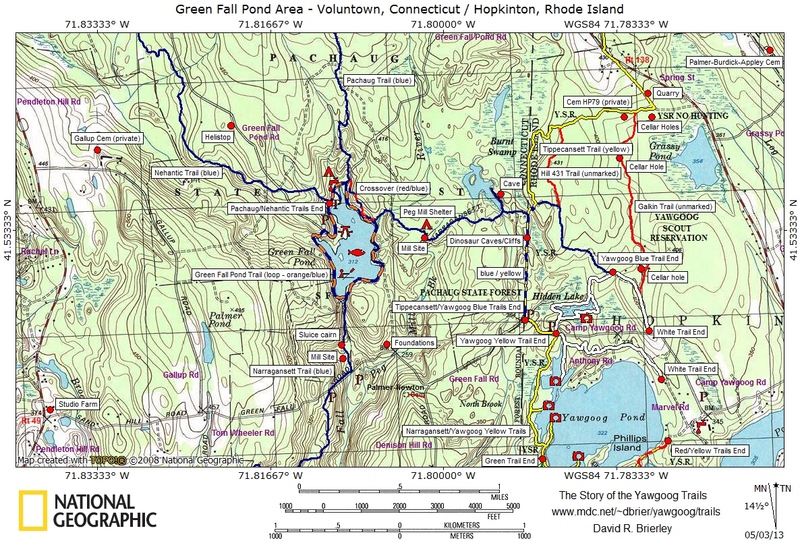 This hike starts at where the Mount Tom Trail crosses Mount Tom Road. The reason for that is that a large portion of this hike is in areas where the gates are seasonably closed to automobile traffic. From the small parking area, follow the Mount Tom Trail east following the shore of Parris Brook. When you reach the Blitzkrieg Trail, turn right and cross over the bridge. The Blitzkrieg Trail is a dirt road that is surrounded by mostly tall pines. Follow it about three tenths of a mile to the beginning of the Deep Pond Trail on the left. Soon another dirt road on the right appears. This is the road to Deep Pond. Take this and then follow the loop trail around Deep Pond. The trail is rather narrow in areas and some sections tend to flood after excessive rain. After doing the loop return back to Deep Pond Trail and then turn right. You will see a rather large swamp area to the left. At the time of this hike I saw several ducks here. At the end of Deep Pond Trail there is a gate to the right. Pass the gate and make your way to the Wood River. Here is a canoe launch and people fish here quite often. This is the point where you may want to turn back and retrace your steps if you are not comfortable with a rather challenging hike. To the right you will see a rather narrow, leaf covered trail. For the next 3/4 of a mile, take your time. This trail, root bound in spots, is very narrow at times and rises above the river below. One slip could be disastrous. The trail also becomes undistinguishable at points. Be patient and be prepared to backtrack. There is one spot where it seems impossible to complete. The trail comes out to a peninsula with the river to the left and what looks like an old mill race to the right and seems unable to cross. Backtrack a few feet looking for some old stonework below to the right. You can cross pretty easily here pushing the shrubbery aside. When you reach the other side the trail is visible again. Hunters and fisherman have also used flagging to mark parts of the trail. I found the flagging fairly reliable. There are a few spots to take in the beauty of the Wood River. Stop. Enjoy it. If you have come this far, you deserve to take a few moments to enjoy the remoteness. The trail will soon come out to a parking area at the end of the Waterhole Trail. This area is known as The Pines. There is another canoe launch here as well as a picnic table. To finish this hike, follow the Waterhole Trail west back out to Blitzkrieg Trail. After turning right, follow the Blitzkrieg Trail back to the bridge. Turn left and follow the Mount Tom Trail back to the parking area.